File Types: JPG,EPS,All Files; File Size: 2.79 MB; Vector: Yes. Usefull for greeting cards and invitations. Easy for editing. 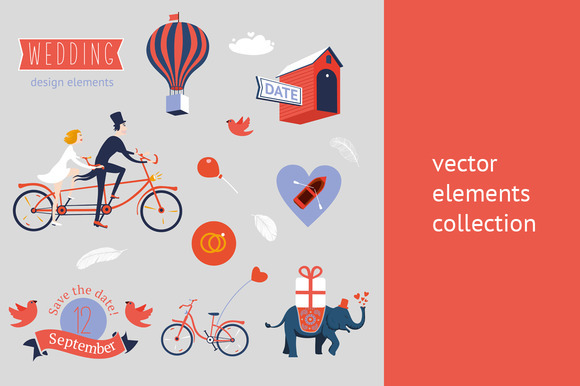 Keywords: isolated, two, ride, vector, happiness, elephant, people, balloons, bike, love, flat, hearts, family, templates, betrothal, retro, collection, tandem, woman, colorful, painting, cycling, home, invitation, wedding, romantic, hipster, vintage, lovers, bicycles, illustrations, couple, happy, boats, present, flying, the, greeting, date, bride, save, balloon, elements, and, icon, design, mood, set, groom, board, cards, air, hot.